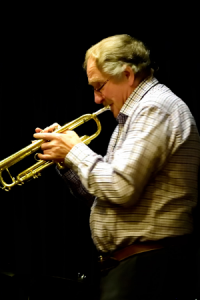 Allan’s trumpet lead is what makes Manchester Jazz one of the mighty bands and his “go for it” solo work has that decisive edge as he slips and slides like a bar of soap in the bath. Allan played alongside Mart in the Zenith Six in 1958. He was a founder member of the Stockport teenager’s formative Dallas Jazz Band. He has toured Europe widely, sometimes in Monty Sunshine’s Band, playing at many Jazz festivals. One of Marty Grosz’s favourite combinations for accompaniment on his European tours is Allan(trumpet), Mart(clarinet) and Colin(double bass). He and Mart Rodger are long time jazz associates with a mutual respect for each other’s abilities. On stage they make a fine pairing, with Allan’s urbane relaxed style a perfect foil for Mart’s fire and exuberance.